It’s that time again, readers. Time to get to know another Uruguayan. You already know me, your humble narrator, and I’ve introduced you to Diego Fagundez of the New England Revolution in the MLS. Now it’s time to introduce you to another young Uruguayan fútballer and new defenseman for Liverpool of the English Premier League, Sebastián “Luganito” Coates. The 6’6″ Coates (pronounced CO-AH-TES… I don’t know how to really do phonetic spelling) was born in Montevideo, Uruguay to a Scottish father and a Uruguayan mother. He was signed to the Uruguayan Primera División powerhouse, Nacional at the ripe old age of 11, and he worked his way up to the main club by age 18. Once he got his call-up, he thrived. He won Man of the Match honors in his debut (against Bella Vista) on April 18, 2009, and never really looked back from there. That first season, despite only playing for three months, he was named the Uruguayan Championship Revelation of the Season. Because of his stellar play for Nacional, Coates was called up to the National team for a crucial home and away qualifying series agains Costa Rica before the 2010 World Cup, although he went unused. He was not taken to South Africa with the big squad, but finally made his international debut in the 2011 Copa América. 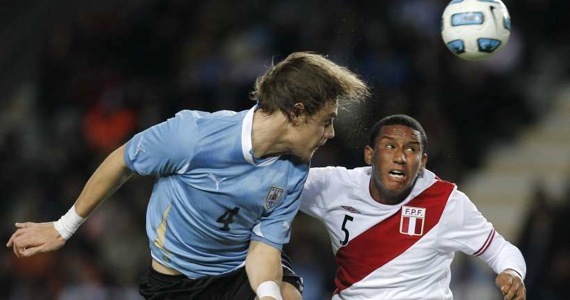 With defensemen Diego Godín and Mauricio Victorino hampered by injuries, Coates was thrown into starting duty along Diego Lugano, the Uruguayan Captain, and the man whom Coates is nicknamed after (Luganito means little Lugano). Coates responded well to the new pressure by winning the award for Best Young Player (essentially rookie of the year) for the tournament as Uruguay became Copa América champions for a record 15th time. As Uruguay rolled to victory in the Copa América, the talk back home with Nacional was geared around a possible transfer for the twenty year old Coates. After much delay and hullabaloo (and Coates’ price tag skyrocketing after his great play in the Copa América tournament), Coates finally signed on the dotted line with Liverpool, joining Uruguayan teammate (and, in my opinon, the best player from South America today) Luis Suárez, who had transferred to Liverpool earlier this summer. The transfer itself was quite historic for Uruguay and Liverpool both. First of all, the £7 million is a record for any player transferred from Uruguay, doubling last year’s record £3.5 million paid by Ajax for the rights to Nicolás Lodeiro. Furthermore, on the back of this deal, the two sides will attempt to establish a partnership in the next few years that would allow Liverpool to continue to take advantage of Nacional’s great history of player development (14 of the 23 players on Uruguay’s Copa América squad play or have played for Nacional). Liverpool already has Luis Suárez, who was originally a product of Nacional before ending up in the Dutch league, which should help the youngster Coates adjust to life in the Premier League. The partnership between these two clubs will not only help Liverpool find talent for years to come, it will bring a lot of well-deserved attention to Nacional (and hopefully some much needed money). I, for one, can’t wait to see some more Uruguayan talent make headline news all over Europe. It can only help the Primera División and the country itself. As for Coates, he probably won’t get thrown right into the middle of life in the Premier League. Historically, South American players are kept back a bit as they adjust to lives in a league known for its rough-and-tumble type of play, not to mention life on a new continent. With his considerable size, I don’t suspect that he will have too much trouble asserting himself when he finally gets his chance. Liverpool fans will love how he plays in the air (dangerous on corner kicks), as well as his no-nonsense approach and mistake-free play on defense. If Coates does for Liverpool what he did for Uruguay in the Copa América and during his time on Nacional, Liverpool fans might soon have to learn some Uruguayan fight songs to better cheer their team on when they take the pitch. He was on the bench this past weekend already. and Ken Dalglish keeps saying that he’s ready. he was key starter for a Copa America winner, and they expect him to get minutes soon.